Clubs to Hire was set up in mid 2010 by Dubliner Tony Judge and his friend Gerry McKernan ClubstoHire.com – is an online enterprise conceived to help travelling golfers avoid the increasing cost of transporting their clubs on international flights as airlines, especially budget operators, began to charge additional luggage fees. It offers golfers the chance to hire the latest clubs for as little as €35 per set per week, through a simple online booking system with a convenient pick-up and drop-off at the destination airport. To help with the set up Judge and Mckernan secured the services from another of Judge’s friends in the form of European Tour star and now Ryder Cup captain Paul McGinley. McGinley invested in the company at start-up and became its brand ambassador. McGinley was key in introducing the rental concept to leading golf manufacturers like TaylorMade and Callaway. Three years on from the launch in Faro and the Dublin-based online company has helped more than 50,000 golfers travelling across Europe – saving them more than €1m in excess baggage charges in the process – and made itself a profitable business at the same time. There are now 16 locations where sets of clubs can be rented from: Alicante; Barcelona; Belek; Faro; Girona; Gran Canaria, Tenerife; Isle of Man; Lisbon; Malaga; Murcia; La Linea/Gibraltar; Palma, Majorca; Paphos, Aphrodite Hills; as well as Edinburgh, the Isle of Man and Dublin. In providing this reliable service, the company continues to benefit from the charges of budget airlines. German golfers now face up to €150 for taking their clubs abroad with the likes of Air Berlin and TUI, while British golfers can expect to pay up to £100 (€118) to transport equipment on airlines such as Ryanair. The business concept may be relatively simple, but the choice of destinations is calculated and designed to offer assistance to golfers at their most preferred locations across the Mediterranean. This year, ClubstoHire added Barcelona and Girona to its stable of Spanish destinations, so that premium sets of clubs can now be hired from eight different locations in Spain – by far the most popular overseas golfing destination for British and Irish players, attracting 29% of those who travel abroad to play. It is this vision and dedication to travelling golfers that has seen the company take several service accolades, none more significant than the ‘Innovation for Best Service’ award at the golf industry awards hosted by German publication Golf Magazin in Hamburg last year. Closer to home was the nomination by the Irish Times this year for its business awards, which placed the company in the Top 3 firms in the country for innovation and service. With record numbers booking sets of clubs, the company has been forced to adapt and upgrade its website to meet growing demand. In March, a brand new site was launched to provide a faster, more comprehensive service than the original version with a larger capacity to cope with the increasing number of bookings. The company is forever moving forward. In June this year, ClubstoHire launched its own comprehensive ‘Guide to Golf on the Algarve’ for thousands of golfers visiting Portugal. The 32-page publication provides an in-depth course guide for all 36 golf clubs in the coastal region, as well as details of established restaurants and places to stay and relax during a golfing trip. 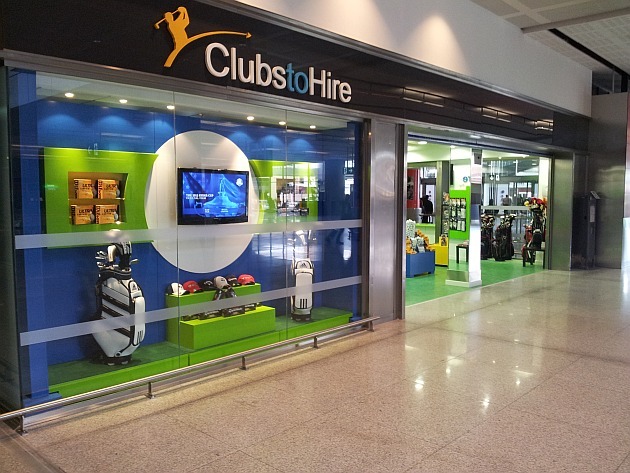 It is supplied free with every set of golf clubs rented from Faro airport, while a further 5,000 copies are distributed to visitors hiring a vehicle from the SIXT car rental operator. "We will not rest on our laurels,” said Judges. “We will continue to provide the best possible club-hire service for travelling golfers across Europe and we will also continue to expand to ensure that ClubstoHire.com operations are available in as many popular golfing destinations as possible,” he concluded.